With policymakers warning about rising household debt levels, a new survey shows that Canadians are both worried about what they owe, and in denial about how their debt compares to those around them. The seemingly contradictory conclusion was reported on Monday by the Toronto-based online mortgage comparison service RateSupermarket.ca, which polled nearly 3,000 Canadians across the country about their feelings on household debt. Despite the fact that 60.1 per cent of respondents said they were not comfortable with their current debt levels, the majority -- 50.3 per cent -- also believed their debt levels were below average. A similar pattern emerged on credit cards. Plastic was by far the leading cause of debt concern among respondents, at 38.8 per cent, with more than a quarter indicating that they owed more than $5,000 and nearly 10 per cent owing more than $10,000 on their cards. But only 13 per cent believed their credit card debt was above average. And close to 45 per cent of those who said their credit card debt was on par with most Canadians reported owing more than $5,000. “People understand it’s a problem, but [think], ‘It can’t be that big of a problem for myself,’” Kelvin Mangaroo, president of RateSupermarket.ca, told The Huffington Post. As he sees it, this reflects “denial,” and the fact that Canadians have developed only a surface-level awareness about the dangers of carrying hefty debt burdens. “The first step is always identifying that it’s an issue, so it seems like the majority of people have kind of done that,” he said, adding that the current availability of cheap credit may be preventing Canadians from understanding the implications of falling further into debt. “People might be taking a shorter-time view than is probably prudent right now,” he said. When it comes to the type of purchases that are driving Canadians into the hole, Kelvin Mangaroo, President of RateSupermarket.ca, says he was surprised to discover most respondents indicated that everyday expenses are primarily to blame. 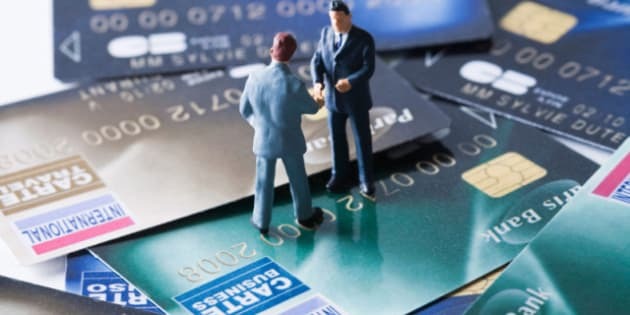 The report did not reference national averages for household and credit card debt levels, but a recent study by TransUnion put the average non-mortgage debt level among Canadians in 2011 at $25,960. According to that study, average credit card debt declined slightly year-over-year, dipping by 1.49 per cent. The RateSupermarket.ca study comes on the heels of new Statistics Canada data, which shows that in 2009, at the beginning of the current low interest-rate cycle, the average borrower already owed 114,400 including mortgage debt. According to Statscan, Albertans were deepest in the hole, owing an average of 157,000, while those in Atlantic Canada carried the lightest debt burden at $69,300.